Length: 6 hrs. 31 min. Charles Templeton was one of the greatest preachers of the mid-twentieth century, and a friend and mentor to a young Billy Graham. He was also in the early stages of becoming an atheist. 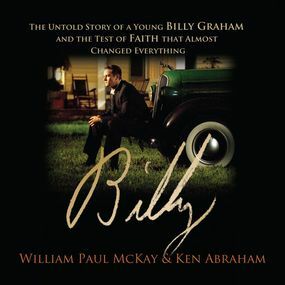 Based on the remarkable true story, Billy is the untold account of the early years of Billy Graham and the relationship between these two extraordinary men told from the perspective of a dying Charles Templeton. Reminiscing to a reporter from his hospital bed in 2001, the haunted Templeton recounts Billy's simple beginnings, the moving love story of Ruth Bell, the moves of "chance" and divine blessing that brought him success, and the growth of their friendship. Together, they had envisioned plans to win the world for Christ. But life brought them both to a crisis of faith. You already know how the Billy Graham story turns out. Billy tells of a moment in history when things might have turned out very differently.